Perennial. Culms prostrate; 10-50 cm long. Culm-internodes distally with pubescent line (2 lines). Culm-nodes glabrous, or pubescent. Lateral branches ample. Leaf-sheaths glabrous on surface; outer margin hairy. Ligule an eciliate membrane; 0.2 mm long; erose. Leaf-blades lanceolate; 1-5 cm long; 3-15 mm wide. Leaf-blade surface pilose; sparsely hairy; hairy adaxially. Leaf-blade margins undulate. Leaf-blade apex acuminate. Inflorescence composed of racemes. Racemes borne along a central axis; unilateral; 0.5-1 cm long. Central inflorescence axis 0.5-4 cm long; pubescent. Spikelets solitary. Fertile spikelets pedicelled. Spikelets comprising 1 basal sterile florets; 1 fertile florets; without rhachilla extension. Spikelets ovate; dorsally compressed; 2.3-2.5 mm long; falling entire. Glumes dissimilar; shorter than spikelet; thinner than fertile lemma. Lower glume ovate; 0.33 length of spikelet; membranous; without keels; 3 -veined. Lower glume apex obtuse. Upper glume ovate; 0.75 length of spikelet; membranous; without keels; 5 -veined. Upper glume primary vein scabrous. Upper glume apex obtuse. Basal sterile florets barren; with palea. Lemma of lower sterile floret similar to upper glume; elliptic; 1 length of spikelet; membranous; 5 -veined; scabrous; rough on midvein; acute. Palea of lower sterile floret 0.5 length of lemma. Fertile lemma elliptic; dorsally compressed; 1.3 mm long; indurate; shiny; without keel. Lemma margins involute. Lemma apex acute. Palea involute; indurate. Nativa en Colombia; Alt. 0 - 1500 m.; Amazonia, Andes, Guayana y Serranía de La Macarena, Orinoquia, Pacífico, Valle del Cauca. Argentina Northeast, Belize, Bolivia, Brazil South, Brazil Southeast, Colombia, Costa Rica, Ecuador, French Guiana, Guatemala, Guyana, Honduras, Leeward Is., Mexico Gulf, Mexico Southeast, Mexico Southwest, Nicaragua, Panamá, Paraguay, Peru, Suriname, Trinidad-Tobago, Venezuela, Windward Is. Panicum brachyclados Rchb. ex Trin. 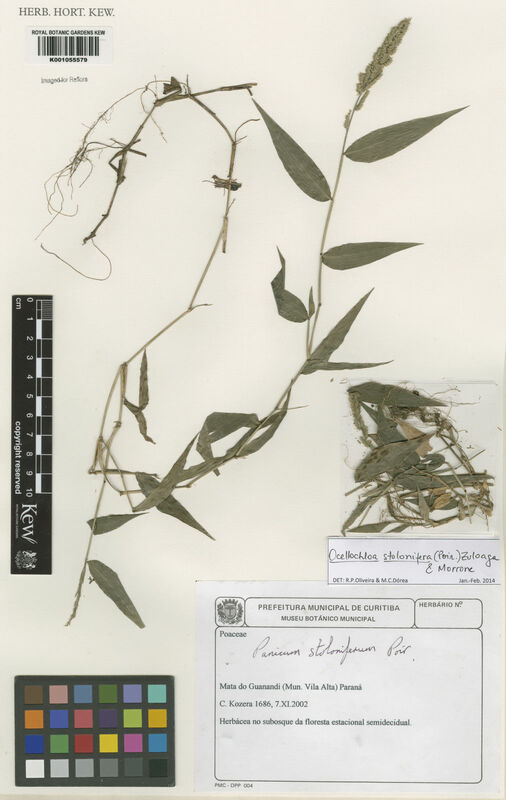 Panicum ctenodes var. majus Trin. Panicum nemorosum Rchb. ex Steud. Panicum pseudoundulatifolium Roem. & Schult.